Now lives with God above. And I never knew his love. Whose heart beat close to mine. For I never got the time. Before the dawn could break. Where his share of love he takes. Who now walk by my side. Dropped to the ground too soon. Who was gone before he bloomed. And grant me one last wish. To on his head bestow a kiss.  Who to me are very dear. For which I shed a tear. As to why he couldn't stay. And wait til I go home. 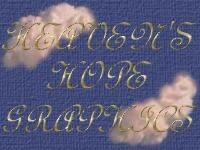 Then within the gounds of God's heavenly home. My son and I will roam. Born to this world too early. 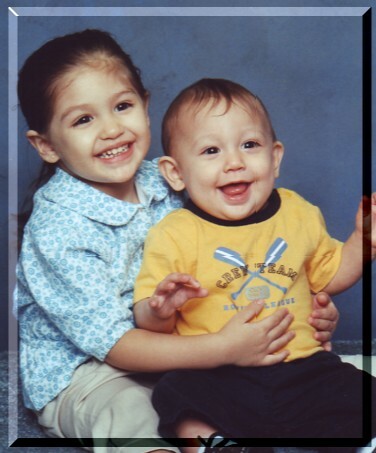 I found out that I was pregnant with my third baby on April 21, 2005. It was a true shock to myself and my husband. I started to go to all my Doctor's appointments and everything was looking great. We begin to tell our family and they were very happy to have another baby in the family. I started out with a great pregnancy, no morning sickness, nothing. 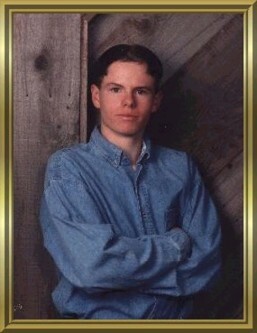 Then on May 5, 2005, I was about 6 weeks along, I had gotten into a really bad car accident. I had gone to the doctors and everything was fine, the baby looked great. 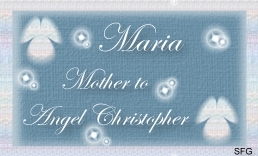 I was getting further along, really looking forward to doing some baby shopping, when out of the blue, on June 5, 2005, at my mother-in-law's house I started to feel different - something just wasn't right. I went to the bathroom and looked down to see blood. I wasn't sure what was going on, I thought that I was losing my baby, I called my doctor. She said that it was up to me if I wanted to go to the hospital or wait til Monday. I was going to wait because the bleeding wasn't that bad, but then whenever I sat down and got back up, it was like a flood. So my husband and I took our two other children home, and I went to the hospital only to sit there for about 3 hours thinking that I'm losing my baby and nobody here seems to care. They called me back and did all kinds of testing. It was going on 8:00pm, and my husband came up and by that time they were going to take me back for an ultrasound. I'll tell you I was laying on that table scared to death wondering what it was going to show. The nurse pulled up my gown, and I closed my eyes. She said that she was going to start now, "did I want to watch?" I wanted to so much, no, but I couldn't. I open my eyes to see this little baby inside of me just waiting to see the heartbeat. She finally said, "There it is, perfect, 155 bmp." My heart just dropped, my baby was alright. The days and weeks went on and on, and I still continued to bleed and nobody is truly sure why. 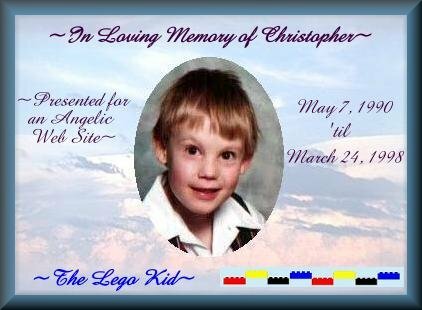 They send me back and forth to the hospital for more and more ultrasounds, at one point the nurse said that she thought that I was bleeding because I had lost a twin. That put my heart at ease, but I know that it wasn't true. It was now going on July, and we celebrated my birthday and I was still bleeding. A few days after my birthday, July 26, after my husband came home from work I went to use the bathroom, and I noticed that I couldn't stop bleeding (and this is around 1:00 a.m. or so). So once again I make my way to the hospital to be tested again and told nothing again, just go home and try to stay off your feet. Now I'm thinking, how am I going to do this with a 1 year old and 2- 1/2 year old? So I went home about 8:15 a.m. to get my kids to drop them off at my mother-in-law's house, which only lasted that day. But my mother did come over every day and to help me at night so I wasn't lifting. Now we were getting into August, and yes, I'm still bleeding, and no, they still don't know why. On July 31, 2005, my mother took me back to the ER since when I woke up that morning I had bled though my pants, and this time I saw a guy doctor who wasn't worth anything if you ask me. Sent me back home and said just take it easy. 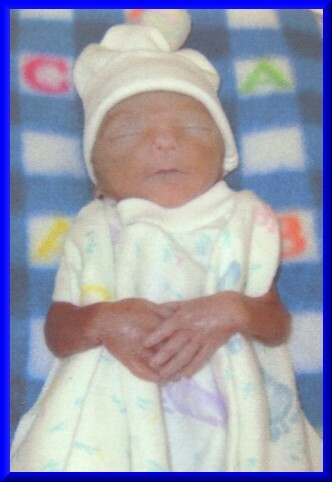 Now this date always scares me the most... August 1, 2005, I was 19 weeks. My husband had just left for work around 1:00 p.m. I just laid my daughter down for her nap, and my son wasn't home (thank God). So I decided to lay down because I wasn't feeling that hot. I had woken up a little after 4 to use the bathroom, and I knew that something wasn't right. I used the bathroom, passing blood clot after blood clot the size of golf balls. I started to get hot and cold flashes, the room started to spin, and the next thing I know I woke up on the bathroom floor. I called my doctor's, called my neighbor, and called my mother. My neighbor came right over, she said that I was so pale and my skin was so cold. My mother got there in like no time, and rushed me to the ER to see the same doctor I saw the day before. He was going to send me home until he called my ob/gyn who told him that there was no way that I was going to be going home since I've been in and out of the ER and that I passed out. They put me on oxygen just to help the baby, and gave me fluids and sent me up to labor and delivery. 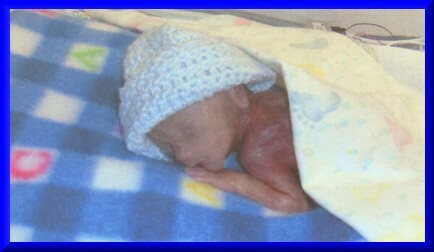 I started to feel better when I heard the baby's heart beat, always around 150 bmp. The next morning the nurse came in around 4:00 a.m. or so to do a blood count, and then my doctor came back in around 8:30 a.m. She said that my blood count was really low and that I wasn't doing too great. She then said that I was going to need a blood transfusion, or I wouldn't make it a month or so. So I got 2 pints of blood Tuesday morning and my blood count went back up, now I just had to get my blood pressure up, it was staying at 77/40. I finealy got to go home on Friday, but had to stay on complete bed rest. So that's just what I did. My son went to my mother-in-law's for the week. I only got to see him on Saturday and part of Sunday. My daughter went to my sister's house in the mornings and came home around 4:00 p.m. It was really hard, but I knew it was the best thing for our baby. On August 8, 2005 - IT'S A BOY. My husband and I were so happy to have another little boy. The weeks went on and on. I went to one of my doctor's appointments where they did an ultrasound, and said that I had a placenta abruption. This was on August 25. So we started to plan for me to go to MUSC (which is a high risk hospital) when I got to be 24 weeks, which would be September 5. I was really looking forward to going since I would only have to be there for 8 weeks, then they would move me back up to Summerville at 32 weeks, which would be October 31. I was really happy knowing that I was going to have my baby boy in about 8 weeks or so. 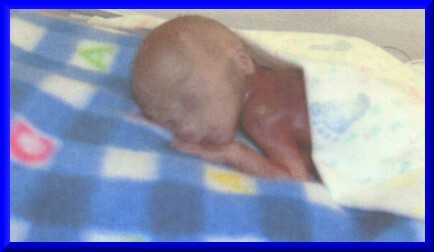 Then on Monday August 29, I went in to the doctors for a fetal heartbeat check and once again it was 156 bmp. I went home, got back into bed, and watched some t.v. My husband and I went to bed around 9:00 p.m. and I couldn't sleep so I watched TV. I started to get these pains and I just blew them off. I used the bathroom a couple of times and the pains were getting worse. I'm laying in bed gripping the sides of the bed thinking that this isn't happening now, I'm only 23 weeks. I keep praying to God to help me. Around 1:00 a.m. I couldn't take it any longer. I wasn't really sure what was going on, so I called my doctor. My husband took me to the hospital, and I told him to go back home, that I would call him when I knew what was going on (my doctor was going to send me to MUSC that night instead of the following week). I got up to labor and delivery scared to death, knowing what was really going on, but I just keep putting it out of my mind. Sitting there in the hospital bed, knowing that my water had just broke and waiting for my doctor to show up. She came in and examined me, and at the moment she said that I was 7-8 cms dilated. I just couldn't stop crying. She called my husband, who rushed up there, and whose face was as white as a ghost. I remember asking my doctor "can we just do a c-section" because a part of me just wanted to get it over with. I remember all the NICU doctors in there and pushing him out. 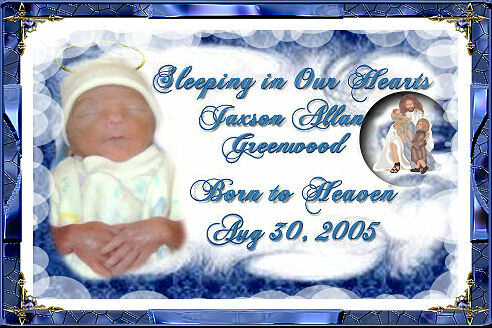 My son was born on August 30, 2005 at 3:18 a.m. I knew that he wouldn't be able to cry, but I just hoped. The nurse came up to me about 2 mins or so after he was born and said, "I'm sorry there is nothing we can do, his lungs aren't open, and did you want to hold him?" In my mind, I said no... I just thought that I wouldn't be able to, but my heart said yes. But I was still scared that I wouldn't be able to let him go. 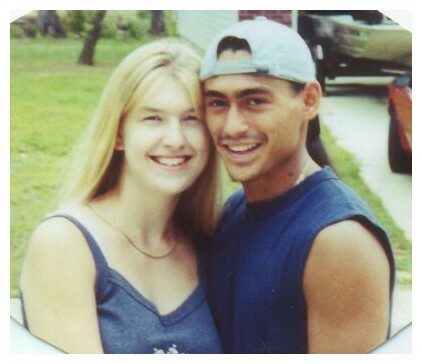 I held him and couldn't believe how much he looked like my husband. 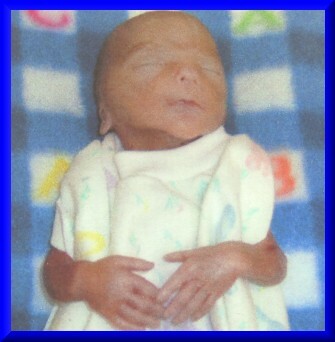 He weighed only 1 pound, 1 ounce, and was 10-1/2 inches long, and he was perfect. 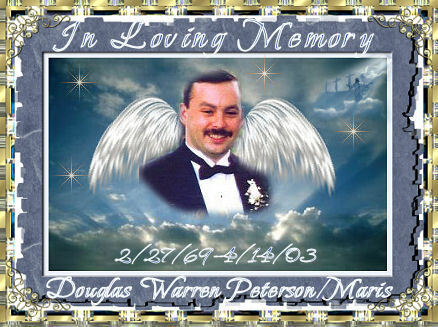 Everyone said their goodbyes and told him how much they loved him and would miss him. 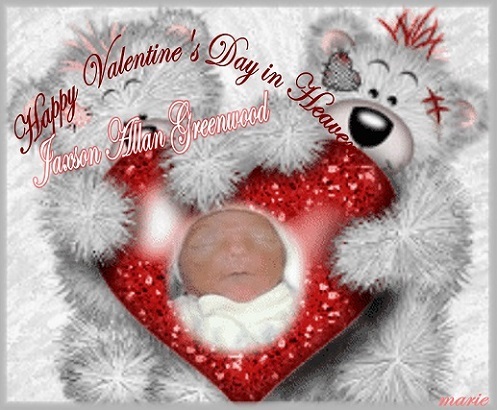 He died 45 mins after his birth in his daddy's arms. 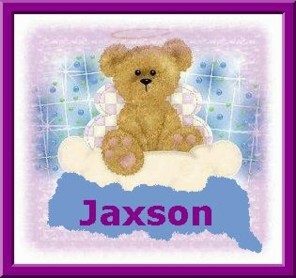 We named him Jaxson Allan Greenwood. 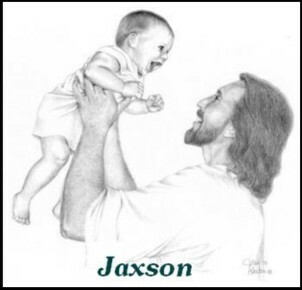 Jaxson never opened his eyes and never took a breath, but that morning his words filled up that room. I held him for an hour after everyone left and told him about his sister Jillian and his brother Braxsten. I stared at him and cried a thousand tears and gave him a kiss goodbye on his forehead. 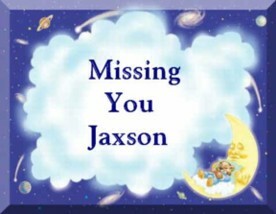 I miss Jaxson everyday. I close my eyes sometimes and imagine him here playing and laughing. 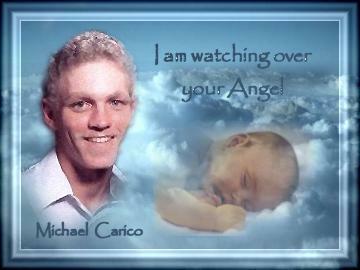 I know that he is safe in Heaven under Gods wing but I think he would have been safer here with us. I sit here tonight with you on my mind, wondering where you are. Wondering if one day it won't hurt so bad when I think of you, or look at your picture. I know that everyone says that, "It was for the best," or that "God doesn't make mistakes." But I wonder; if God doesn't make mistakes, then why did he bless my family with this beautiful child and then take him away from us? I just don't think that makes any sense. 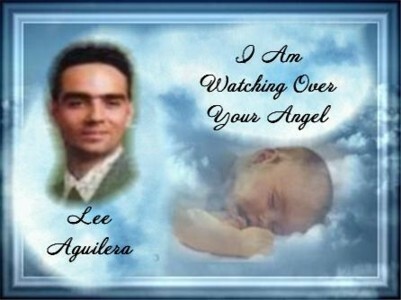 People say that there is a reason for everything but I just don't see what is to be gained when you lose a child. For me there is nothing to be gained but heartache and maybe some depression... that doesn't sound like anyone would enjoy that. You don't think that anything could ever happen to you, but then one day you wake up and your whole world is upside down. 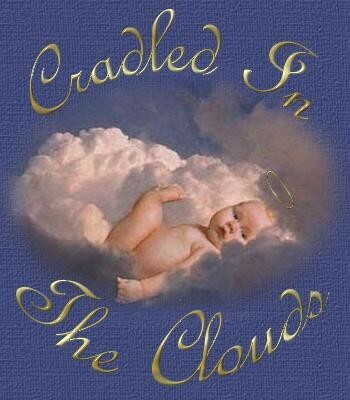 You start to ask yourself a million questions -- "what did I do, does God hate me so much that he would take my baby from me, was there something that I could have done differently?" 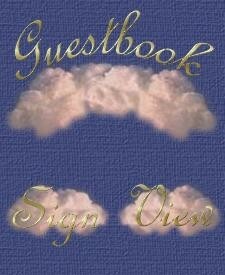 And of course, none of your questions get answered. I cry myself to sleep most nights, just thinking of you. I wonder to myself what you would be like right now. I try to imagine hearing you start to laugh and coo, hoping that will ease my heart. 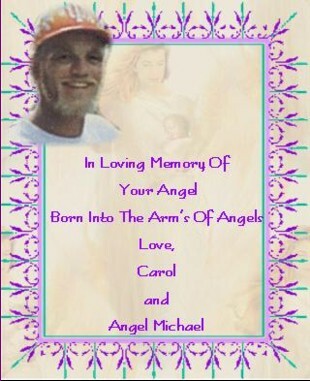 But then I start to think about what you would be doing right now in Heaven where I know you are always safe and warm. I believe in my heart that you have made it, I know how strong you were, you fought to stay alive inside of me for 23 weeks, and then after you were born, you fought for another 30 minutes. I may never know the answers to the questions I ask and for now that is alright. But what I do know is that every tear that I cry, you are always there to catch them. I know that every time the wind blows, it is you sending us kisses, and that every time the warm sun sets in the evening it's you sending us hugs. I know that you are everywhere I am. I know that you are a part of me, and that every time my heart beats, it beats for you too. I may never get over losing you, and I guess that's alright too. 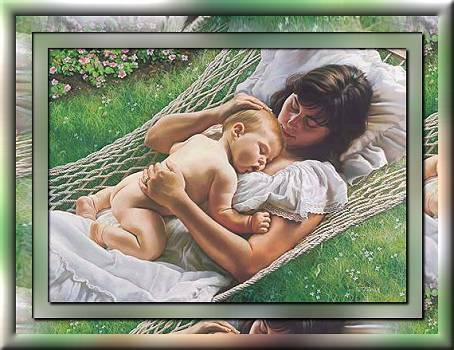 Right now you may be in God's arms, safe from the world you never got to know, but the arms of your family miss you and wish to hold you. I may never be able to sing you to sleep or rock you in my arms, but you will always have a very special place inside my heart. 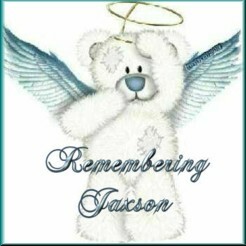 Jaxson, I know that you are far away from us, but to me you will always be sitting right next to me. I love you forever, my sweet angel boy. 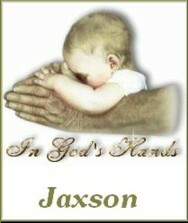 Watch over your Mommy and Daddy and Jillian and Braxston because they miss you too. 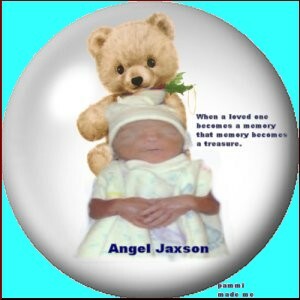 These are two gifts for Angel Jaxson from my friend Marie. the reason we just couldn't see. We lay awake at night praying that our sweet baby is alright. but that is so very far. a very big and special part. 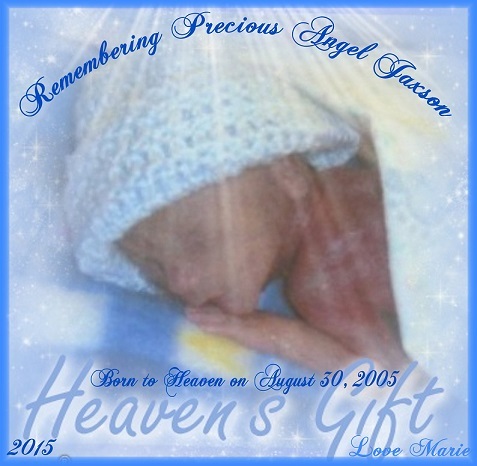 To our lost but not forgotten sweet baby born to Heaven. 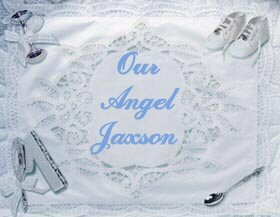 "You Were There (for Benjiman)"
We chose the song playing on Jaxson's web page by George Canyon "My Name"
because we didn't know his name until he was born. 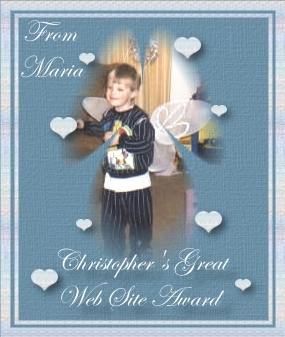 Kristie ~ your webpage is so beautiful, I would be honered if you would add this award from my angel to Jaxson's webpage.